"Oh, this hand of mine!" said the young Birjia woman. She went on to explain in a matter of fact way, tenderly lifting her limply hanging left hand with the right one: "Last year I met with an accident and broke this hand. I don't have enough money to go to the town hospital. Initially there was pain, but now, not much, and I got used to working with one hand. You see, as well as that my husband passed away a few months ago, and I'm earning for the whole family." This Birjia woman, not in a position to afford medical treatment for her broken hand, had managed to live with it! 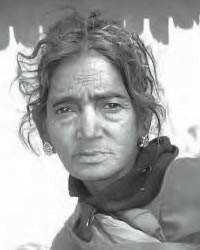 Birjia, or Birgia, people are also known as the Bijori. They live mainly in Jharkahand, and some parts of Chhattisgarh. They basically live in the interior of the forests and do not have proper access to the outside world; as a result they lack education and proper medical facilities. Their forest territory is inhabited by a lot of wild animals. The wild animals constantly pose a threat to their crops and their lives. Despite such a small population of Birjia, there are some Christians, the reason being their receptivity to the Gospel message. It is good to see some Birjia Christians working as pastors, reaching their own people with the Good News. There are also some cross-cultural evangelists. The people are very positive towards any Christian activity. One Birjia Christian is very interested in translating God's Word into his mother tongue. These people are in need of education, medical help and community development. A strong Birjia Christian community would be established only if God's Word is given to them in the language they can best understand - Birjia. Birjia people are economically very poor; most of them still depend on forest products for their livelihood now. They are short-statured and not very healthy, due to malnutrition. The literacy rate is also very low among them. However the people are very good-natured, and are happy to see outsiders. They warmly welcome even a stranger, and offer to help in every possible way. * The often neglected Birjia people to be given benefits from the government. * Christian workers to go as educationalists, medical workers, Bible translators and literacy workers. * The growing number of Birjia Christians to be rooted in God's Word. View Birjia in all countries.